(VEN) - The picture of a farmer from Tien Giang Province’s Go Cong Town with his smile after early harvesting of rice fields despite facing serious drought and saltwater encroachment has touched the public. 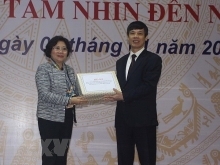 Thanks to greater efforts of local government and management agencies, Tien Giang Province has achieved positive results. Tien Giang Province People’s Committee issued a bold decision before the Lunar New Year 2016 including pumping water from Tien River to Go Cong with a long distance ranging from 50-60km. In addition, the committee directed districts to use high-capacity pumps in 400 points in order to pump water from main canals to interior fields. The committee also listened to opinions of agricultural experts and decided to pump saltwater under 1.5g a liter and 1.8g a liter to freshwater areas in order to save rice fields. All rice fields in freshwater areas have to date had enough water. 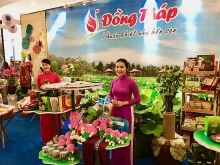 Tien Giang Province has saved around 27,000 hectares of rice by March 25 thanks to suitable solutions. After harvesting, farmers can sell rice to pay bank loans and compensate for investment costs. Ben Tre Water Supply and Sewerage One Member Company Limited General Director Nguyen Thi Diem Phuong said that the company has deployed the pumping system in Chau Thanh District’s Quoi Thanh Commune with a capacity of 17,000cu.m a day to lead freshwater to the city of Ben Tre, while gradually minimizing salinity in running water to the lowest level. In addition, the company has strictly controlled operations to ensure better water quality. Ben Tre Province has also implemented the An Hiep Water Plant construction project since 2012 with the main goal of bringing water to the city with larger scale. The whole project is expected to be completed by the end of June 2016, while the raw water pumping station was completed by March. Around 30,000cu.m of freshwater are daily provided for the city. Tien Giang and Ben Tre have made greater efforts in minimizing drought and saltwater encroachment in the region. 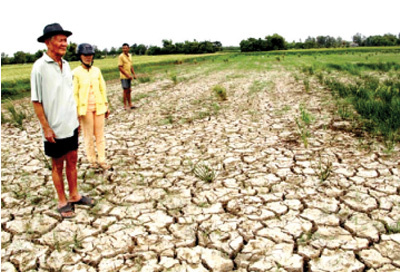 Although some hundreds of thousands of hectares of rice growing were damaged, the region will implement cultivation on 4.6 million hectares, an increase of nearly 12,000 hectares compared to the previous year. Rice output this year is expected to increase by more than 100,000 tonnes. According to the Ministry of Agriculture and Rural Development’s Water Resource Directorate, China and Laos started to discharge a large amount of water from reservoirs of their hydropower plants on April 3 to reduce drought and saltwater encroachment in Vietnam’s Mekong Delta.